Using very simple vocabulary, this isn't a thrilling story in and of itself - the joy for young readers is in figuring out how to read for oneself. 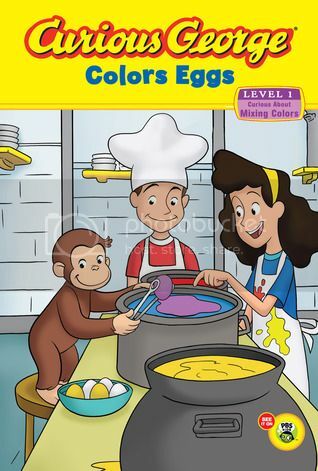 Curious George is cautioned to stay clean while dying eggs with Betsy and Steve. He experiments with primary and secondary colors, making a huge mess. His decision to hide out in the sink turns out to be a wise one, as he's all cleaned up and ready when the man in the yellow hat comes to pick him up. Written by staff writers and released under H.A. Rey's name, this simply doesn't compare to the original classic, but is still sure to be in demand for Easter. Here's a very simple Easter story. 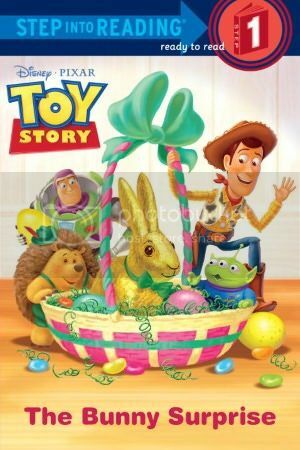 The toys from Disney's Toy Story are stunned by the arrival of a chocolate bunny at Easter. EASY to read with mostly one-syllable words in large font. The plot is thin, but the trademarked characters will sure to be a draw for kids who enjoyed the movie. 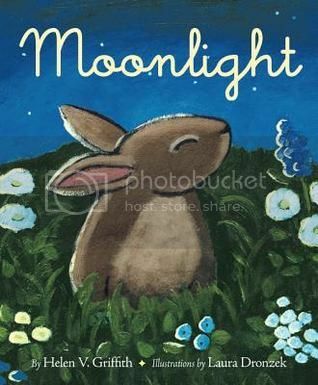 Simple and sweet, about a rabbit enjoying the buttery moonlight. A lovely bedtime story for toddlers and preschoolers. I read this with a group of 2-3 year olds and they all took the butter simile a little too literally. Still, I think I'll get a lot of mileage out of this story at my library, I'm sure it will be welcomed at Easter, as a bedtime story, pajama storytimes, Dream Big Summer Reading program and more. Pair this with Kevin Henke's Little White Rabbit for a sweetly imaginative bunny-themed storytime. Hilariously wonderful! This little pig knows just what he wants to be when he grows up... The Easter Bunny! "You are a terrific piglet," says his mother, "We love your squiggly tail and your little black eyes and your snouty nose and your adorably triangular ears... you are perfect... just exactly the way you are." "Just exactly the way I am... is like a piglet who is going to be the Easter Bunny." Liam the pig decides, "This is the kind of problem... that is called heartbreaking." It takes some help from his understanding grandparents, who declare that everyone else has "the imagination of a kumquat." "You know how to make an Easter Bunny suit?" Liam asks. "Absolutely not... We will order one on the Internet." 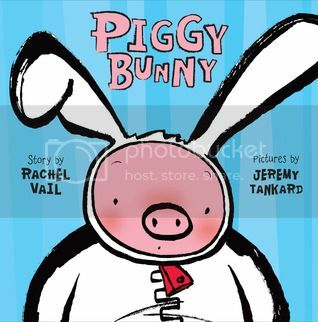 A dry sense of humor, and heavily lined digital illustrations which alternate between white and brightly colored backgrounds with an expressive, adorable family of pigs makes this a sure-fire hit for Easter.